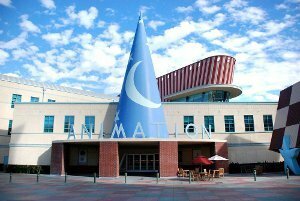 Kidzworld got to visit the famed Disney Animation Building in Burbank, California to get the backstory on the new “Pooh” film from the directors and the voice actors behind Pooh, Tigger and Rabbit. 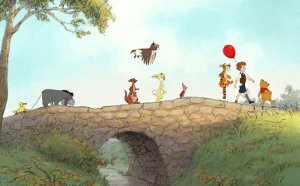 Chances are that you are familiar with the colorful tales of Winnie the Pooh and his pals Tigger and the gang from the 100 acre wood. You might have read the books, had them read to you or seen the charming Disney short films on TV. 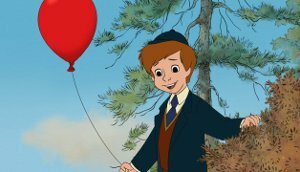 The Disney animation wizards and voice actors again bring Pooh to life in his first big screen adventure in more than 35 years. We were actually seated in an office inside Mickey’s giant Sorcerer hat! 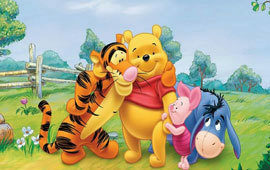 Kidzworld: Way back, other famous actors voiced Pooh and Tigger. Did you try to sound like them? Jim Cummings: Yes, well, (you do) that sort of fluttery, quaky little whimsical voice, and then from there you step into the personality. Pooh will never be the bully so you’ve got to stay true to the character and hopefully expand it from there. It’s like a recipe. You have to follow the original recipe and voice, but you can put a little of your own salt in there and bring it up to date. Kidzworld: Did you ever shoot a scene where Tigger and Pooh are together at one time so you are basically talking to yourself? Jim: (laughs) Back and forth in a conversation? I stopped doing that because a (little) Pooh would be left on “Tigger’s first syllable and I don’t want that to happen again. Kidzworld: Why do you think these characters are as popular today as they were when they were created so long ago? Jim: These stories will always be sweet and these characters will always be great. They don’t need skateboards, they’re not selling Frisbees. They’re not linked to a fad, they’re not linked to any trend, and kids are always going to have wonderful childhood memories to draw from. It pulls on every heart string you have. They’re evergreen, they’ll always be there. No batteries required, just bring your heart and you’ll be happy. Kidzworld: Pooh says he’s “a bear of very little brains”, when you play him do you think you have to be a little goofy and not the brightest bulb? Jim: He’s not all that self aware. I think he just sees the world through honey-colored glasses and he’s very plain-spoken. The two young directors of “Winnie”, Don Hall and Stephen Anderson brought you The Emperor’s New Groove, Tarzan and Meet the Robinsons before taking on “Winnie”. 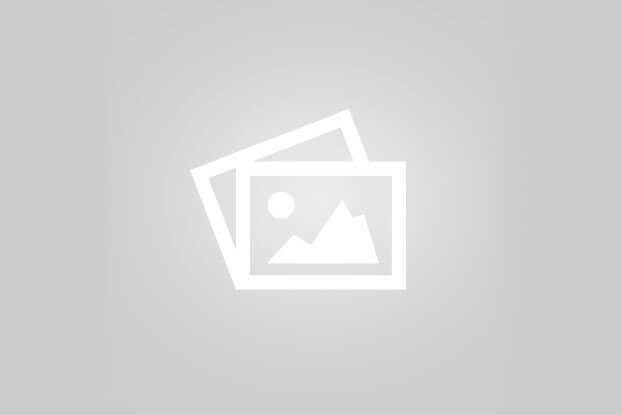 Kidzworld: What was the challenge of bringing “Winnie” to modern audiences? Stephen: We realized early on we have to find a balance between the pace of most movies today (and the classic Disney “Winnie” shorts). We don’t want to go too far; the route of crazy quick cuts, but we also didn’t want to stick to strictly to the slower pace of the ‘60s. So that was one of the challenges we faced: how far to go one way or the other before we break it. Don: This was all about returning Pooh to his roots. We read the books by A.A. Milne. Steve had read them as a kid. I hadn’t. We were super impressed how witty they were and how funny they were. I laughed out loud reading them. We knew there was broad audience potential in this franchise. And we watched the films from the ‘60s, which we’d seen as kids, and had very fond memories of. Kidzworld: Can you talk about getting popular actress/singer Zooey Deschanel to sing the theme song? Don: We knew we wanted that song. That was on our list of must-haves. The trick was who’s going to sing it? There’s a pretty short list of people who are appropriate. We could weed out the Lady Gagas of the world. Nothing against her. It wouldn’t work. They showed us the list with Zooey on it and we went, ‘that’s it!” boom! So we brought her in and pitched her the story and she was super enthusiastic. Kidzworld: There are a lot of songs in the film but would you call it a musical? Stephen: It’s a story with music, as opposed to a musical. There are moments like the honey dream where the characters are singing about what’s going on in their heads. Don: It doesn’t follow the form of a musical. It’s like its own genre. Kidzworld: Who thought up using Eeyore losing his tail and the search for it as part of the story? Stephen: That was actually (famous Disney animator) Burny (Mattinson), the legend. John (Lasseter of Pixar) was really fond of (that story) and Burny’s pitch. We then got to talk to Burney Mattinson (58 years with the Disney company). The famous senior Story Artist comes in carrying a homemade stuffed Pooh bear that his wife made and parks Pooh in his own chair. We ask “wazzup with the stuffed Pooh?”… and he tells us the story. 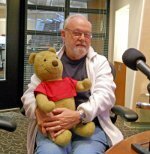 Burny: I was working on the original Disney Pooh shorts back in (the 1960’s). Then about 1973, (I learned) that all three shorts would be put together with a live action opening which they hadn’t done before. My wife was making dolls for our kids. I brought the model sheets (of Pooh) home, gave them to her and she made a pattern and built this little fella (he squeezes the stuffed Pooh). (Everybody loved it) but someone else had been contracted to make the dolls for the live action opening. I took it home and gave it to my kids and they played with it. Then they had kids and gave it to their kids and it finally wound up in the attic. When I heard there was a new live action opening in this film, I took him in and now he’s in the movie. “About time”, we say. In comes voice actor Tom Kenny, the voice of SpongeBob Squarepants! He got a break from Bikini Bottom to voice Rabbit in the new Winnie the Pooh movie and he loved every minute of it. Tom: This is full Pooh-emergence for me, the first time. I was very nervous. SpongeBob was like this comfortable old shoe and this is a whole other franchise. Kidzworld: Can you compare the personalities you have to keep in mind when doing voices for SpongeBob then Rabbit? Tom: Personality-wise, Rabbit is the fussbudget guy who freaks out, doesn’t like people dropping over unannounced and is (crazy) about his garden and (possessions). I guess both he and SpongeBob are both very orderly “people” and they’re both yellow, kinda. Rabbit is kinda greenish-yellow. But contrasting the work, I’ve been SpongeBob from the beginning and you make it up as you go along. There wasn’t 40 years of continuity (to match). I think I’m the fourth person to voice Rabbit so there was this weight of inheriting this character but they were looking to change him up a little bit and not look for a full voice match. When I auditioned for Rabbit, I went back and looked at the original three Disney shorts; back to the roots. I was very surprised when I got it. You do want to honor those who came before though. Kidzworld: Where inside you does Rabbit’s voice some from? Tom: Basically, I’m doing the voice I did when I read the “Pooh” stories to my kids. You just inhabit this character and make it live. Commit to that. Be that “person”. It really is what you see kids do. You’ve got to be comfortable with playing. It doesn’t matter what you look like in voice work. You’re not a prisoner of your body. That’s what I like about voice work. Tom: The animators do use some of what you do physically while recording the voice though, don’t they? Tom: Yes. I’m always moving and flailing around. With Rabbit it’s that fussiness (in Rabbit voice) “Oh that bear! Here he comes again. 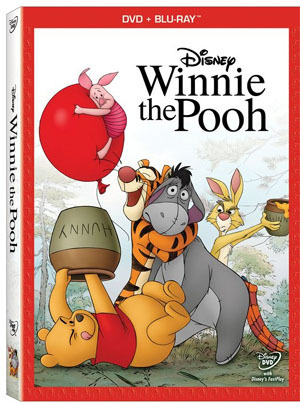 Pooh, why?” He does grunts and groans and sputtering. Kidzworld: Did you know you were good at voices since childhood? Tom: I would read the stories to my younger siblings. I did that all the time and really enjoyed it so it was the training ground; coming up with different voices for all those hundreds of books you read out loud. Kidzworld: I guess you really know the SpongeBob voice without ever having to refresh your memory but each time you recorded Rabbit’s voice, did you have to have what you had done before played back so you could match it? Tom: Yeah. But even on SpongeBob I (voice) a lot of incidental characters and they’ll go “Remember that fish from season three and he came in and ordered a crabby pattie?” Uh, I only sort of remember it. With Rabbit, I needed a little (refresher) when I came in. I did a lot of different (sounding) takes on him. Kidzworld: Are your kids into “Winnie”?